The Adventures of a Foreign Salaryman in Tokyo: Did I just fart or do you know something I don't? The only way to prevent it! One of the big misconceptions of Japan that seems extraordinary hard to set straight is the belief that some Japanese people wear those face-masks due to pollution. This is obviously wrong since Tokyo has comparatively good air quality compared to other cities of similar size. The reason for wearing the face masks are either people having a bit of a cold hoping that the mask can prevent them from spreading it further (very unlikely btw, but anyway) or due to strong sensitivity to pollen or other airborne allergic agent. 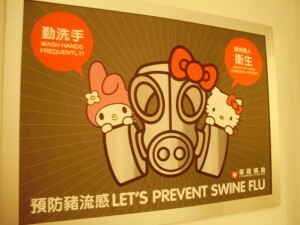 Granted, during the worst 1H1N swine flu scare, a lot of people took to wearing the masks in hope of getting some protection from it and for a while they were completely cleared out all across Tokyo and the factories were working hard to keep up with the extremely increased demand. Never mind that no studies has shown any actual reduction in infection risk due to the simple masks used in Japan. Mrs. Sunshine wears them when she has a cold and moving outside in crowded areas although I have never used them unless in situations when more or less forced to (such as visiting a hospital in work during the 1H1N scare and it was enforced). I'm ok with other people using it but don't really see the point personally. However, today I noticed a person that upped the stakes considerably... One guy on the train wore a full air filtration mask (you know, basically like a gas mask but without the eye cover). My first initial thought was "he must be a bit crazy" quickly followed by "does he know something I don't?!" and then back again to "No, he must just be a bit crazy scared of radiation or something". We'll see if this is a trend or an isolated case, on one side the face masks are getting a bit old so maybe the filtration masks can be a way to get the speculation on why the Japanese wear them going again?